The last time m'colleague and I ventured into Derbyshire, to avail ourselves of the transport network therein, our trip had gone less than well: we left a train at Derby and went outside to catch Trent Barton's Transpeak service to Buxton - it arrived from Nottingham with standing room only. We both squeezed on to Derby city centre where the queue of 40+ people was left behind. We ran progressively late until our itinerary had to be drastically altered. Both Plans B & C went to pot as non-operational bus services formed the day's staple diet. In the end, we caught Hulley's Service 172 from Matlock to Bakewell and back, before returning to Derby with our tails between our legs. That was May Day 2008, could Easter Monday 2010 be any better? In a word, yes. 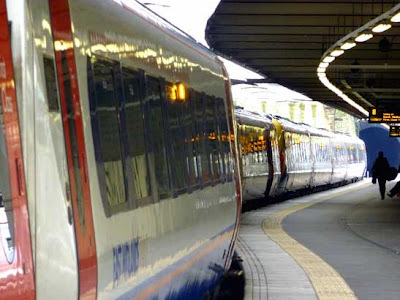 One of the advantages of a Bank Holiday Monday, for those who live a fair old distance from the Peak District and Derbyshire Dales, is that train services ostensibly run to a Monday timetable, while Sunday timings are used for bus services. Bus routes on the Sabbath vary considerably in Derbyshire, accommodating the thousands of tourists who descend on the world's oldest National Park. We left Stamford aboard a CrossCountry Class 170 'Turbostar' at 0805, bound for Birmingham New Street, though alighted at Leicester. 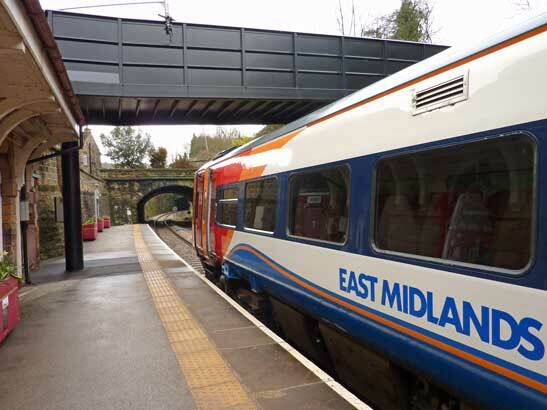 To my eternal shame, the line from Peterborough to Stamford, thence Oakham, Melton Mowbray and Leicester is one I've never travelled before, so Stamford was our Lincolnshire starting point on this occasions for precisely this reason. The three-car Turbostar, 170639, was immaculately turned out and very quiet indeed. So quiet that we accidentally stumbled across a young mother breast-feeding in Coach B. There was insufficient time to venture into Leicester city centre and, besides, the ticket gates often concern me - do they know a break in outward and return journeys are permitted with an Off-Peak Return? Will they retain my outward portion despite the outward journey not having been completed yet? 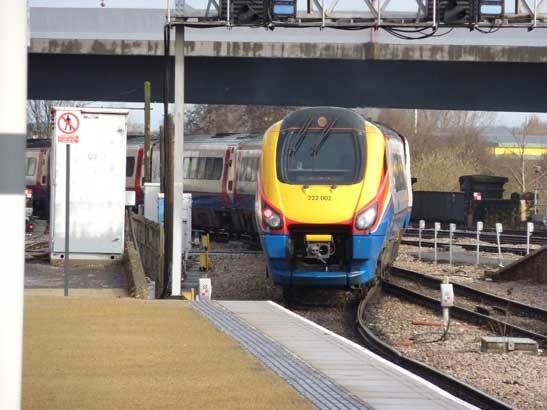 Leicester, despite it being relatively early on a Bank Holiday, was a hive of East Midlands Trains (EMT) activity, with three Class 222 'Meridian's and a couple of HSTs passing through within the 20 minutes or so that we were there. Our next train was operated by EMT and was bound for Sheffield. Meridian 222002 arrived punctually at 0904 and we were soon speeding towards Derby. Once home to the railways, Derby's station had become a bit of an eye sore until recently, when it's undergone a face lift. Very nice it looks, too. Our outward tickets were retained as we passed through the barriers in order to purchase a Derbyshire Wayfarer (DW) ticket, which would enable us virtually unhindered access to all buses and trains within Derbyshire and to/from certain locations beyond the boundary. The DW costs £8.60 for 1 adult+1 child or dog but a group ticket is less than double this, at £13.70 - and there's no requirement to travel with children, so m'colleague and I always purchase this Group version. All mainline stations in Derbyshire and a couple outside the county sell the DW, as too do the larger bus operators. The DW is laminated in a special wallet, so you need to grab the attention of one of the station staff manning the barriers in order to pass through. We were to catch the 0950 EMT service to Matlock. For the past year or so, all journeys on this service now commence at Nottingham; hitherto it was a shorter Derby-Matlock service, requiring people for Nottingham to change. A Class 158 is a frequent performer on here and we weren't to be disappointed as 158783 arrived in good time. The Diesel Multiple Unit (DMU) had undergone its refurbishment at Delta Rail - just down the road, coincidentally - and now sported the red moquette and very high-back seating. No longer do EMT's '158s' offer bucket-type seating. In fact, so substantial are the new seat backs, it makes visibility virtually nil. 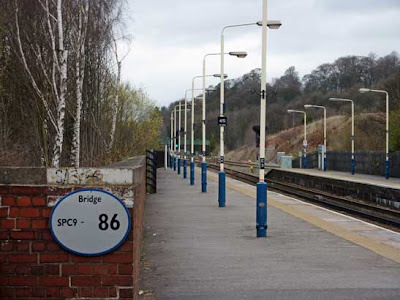 Our journey north from Derby is an all-stopper, calling at Duffield and Belper on the Midland Main Line, before branching off at Ambergate - where once there stood a station whose platforms were laid out in a triangular fashion, though today just one exists on the branch line. Whatstandwell soon followed and this is a location I holidayed at regularly with my family. We then passed through Cromford - where avids of Michael Portillo's Great British Railway Journeys would know stands the world's oldest factory - and onto Matlock Bath, which I see as a seaside resort that's missing the sea, before onto the line's terminus at Matlock. Despite efforts at the less-popular stations to restore signage and general presentation to that of yesteryear, both Matlock and Matlock Bath station signs carried British Railway's 'Regional Railways' logos. Our tightest connection was now - 1035 Service 17 to Chesterfield, operated by Stagecoach in Chesterfield. Matlock now has two bus stations, dissected by the River Derwent. 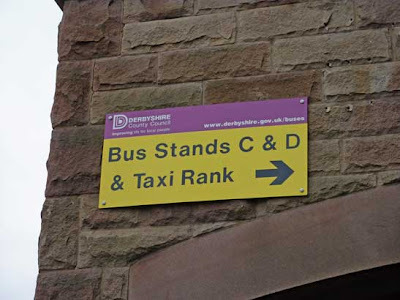 Derbyshire County Council refer to the original station as merely 'bus stands' today, and they're located a good 5 minute walk from the train station. 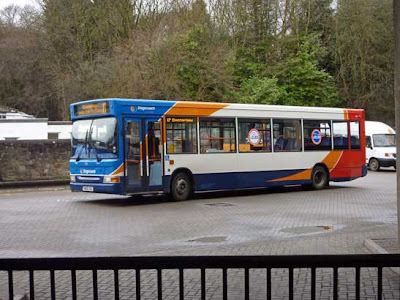 Stagecoach often deploy Volvo Olympians to Service 17 and the route is superb when seen from the top-deck of a vehicle of this type. Initially, the circuitous Lime Tree Hill with its 1-in-7 gradient poses a struggle for many vehicles and then a few miles further, the much more linear Slack Hill offers spectacular views across the valley. Aboard a bog-standard ADL Dart/ADL Pointer, 35261, YN56 SGZ, it has to be said, the experience is somewhat diminished. A brisk walk was needed now to Chesterfield train station to board our third EMT service of the day - this being the 1137 to Sheffield, formed of two 5-car Meridians (222023+222019). 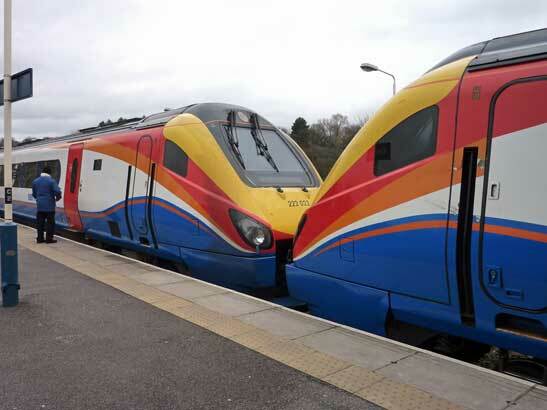 There was more than ample space inside as the 10-car formation headed north through Dronfield to its Sheffield terminus. 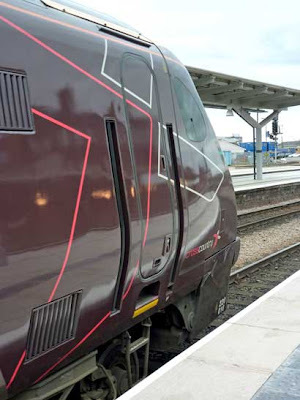 I'd never travelled aboard a two-unit Meridian before and while it was clearly not needed for this journey, I assumed operational staff had calculated it would operate a busy service later in the day. At Sheffield, by chance, we bumped into an LEYTR Member who's a train conductor for Transpennine Express and had a nosey round the cab of one of their Class 185 'Desiros', before heading to the Interchange to catch our next service - TM Travel's 218 to Buxton. Back-in-the-day, this service was operated by Potteries Motor Traction (First PMT) and linked Hanley with Sheffield via Leek, Buxton, Bakewell, Baslow and Totley but reliability issues and tachograph requirements saw the service split at the equidistant locality of Buxton: First South Yorkshire would provide the re-numbered 218 between Sheffield-Buxton and First Potteries would provide the Hanley-Buxton section. 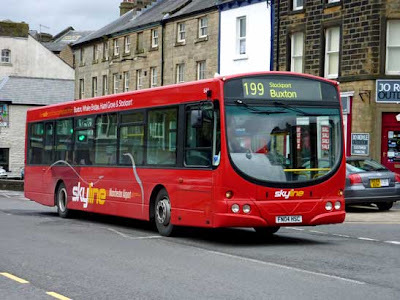 First South Yorkshire, however, lost the contract to operate the service to TM Travel, who now provide the eastern section; D&G now operate the western section, numbered 118. There were a good 30 people at Bay B6 within Sheffield's spotless, award-winning Interchange as we joined the end of the queue. Our vehicle was visible in a parallel lay-over bay, the driver (we presume) having his lunch. We were scheduled to depart at 1230 and so you could imagine our dismay when the 23-seater Optare Solo pulled up at 1229. I couldn't help thinking that TM Travel badly underestimated the popularity of this run. There are only 3 on a Sunday, this being the middle one. A 23-seater Solo was woeful, especially since the service passes through the honeypot of Bakewell on a Bank Holiday Monday. We departed 7 minutes late and the elderly Optare Solo - W286 EYG - really struggled on the gradual inclines through Totley. I tried to keep an eye on the time, but when we joined the queue for Bakewell two miles before the first house, I knew our 15-minute connection at Buxton onto Bowers' Service 61 at 1400 would not be made. It took us just over 30 minutes to traverse Bakewell. Our Solo, with around 40 soles on board, sold 6 tickets to fare-paying passengers. 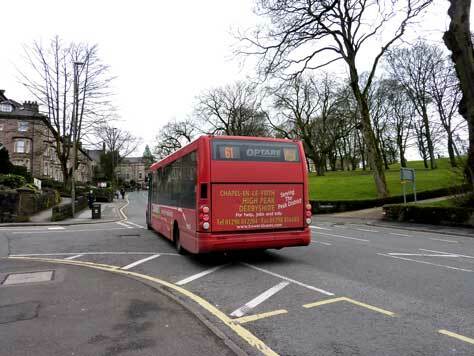 What shocked me was when a very elderly man asked if I knew the times of the buses back! The free bus passes have taken social mobility and inclusion to ridiculous levels! 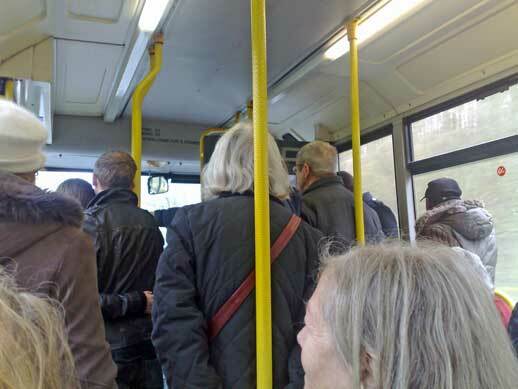 Never mind the overload, people over the age of 60 just simply hop on a bus to somewhere nice without researching the times of buses back! Unlike our May Day 2008 experience, no one was left during this Wellglade-operated journey, and once beyond Bakewell, our driver 'gave it the beans', though a diversion was required as the A6 is currently closed between Topley Pike and Buxton due to a landslide. 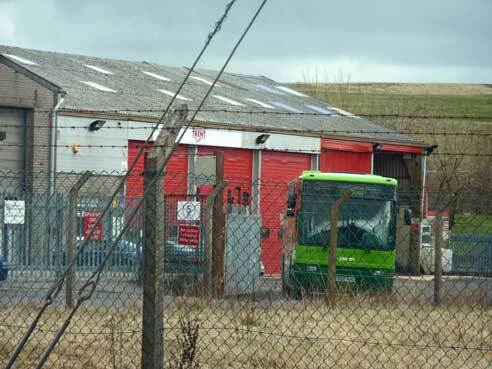 This means all vehicles have to operate via Brierlow Bar and the A515. My Plan B was to catch the 1430 Northern train to New Mills Newtown and then walk to New Mills Central to catch the 1511 Northern train to Grindleford (the latter always being the aim). We arrived in Buxton Market Place at 1414 and saw a queue had formed for Trent Barton's Skyline 199 to Manchester Airport, due out at 1415 - passing the train station, which was a good 10 minutes walk otherwise. What to do? 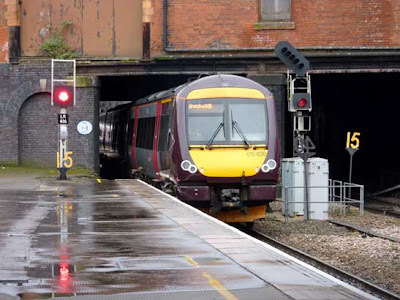 Hope the Skyline 199 would arrive, load and leave in time to deliver us to the station punctually enough to enable us to catch the 1430 train, or just walk to the station and chance that it can be done in time? We both elected to remain in Buxton Market Place and wait for the 'really late bus company', departing as we did at 1425. Traffic was very slow as we headed to the station and there was no train visible as we passed at 1432 so, instead, we remained on our consecutive Wellglade-operated service to Newtown. Our vehicle was a Scania/Wright Eclipse Solar 644, FN04 HSC, that, if we're both honest, sounded as rough as old boots! There was no chance of catching the 1511 Northern train to Grindleford now, so I concocted a plan to return to Buxton using Bowers' Service 61 via Fernilee - a delightful run. We were 17 minutes late alighting Trent Barton's 199 at Newtown and in just over 15 minutes, at 1525, the Bowers service would depart the town centre. We had time to partially wander downhill towards New Mills itself, passing the Swizzles-Matlow factory which, when conditions are right, emits the aroma of Refreshers (or at least used to - can you still buy Refreshers?). Bowers operate Solos on the 61 and this was to be our newest so far - YJ54 UBH, though its saloon heaters were stuck on hot, making for a particularly uncomfortable, if incredibly scenic, journey back to Buxton. 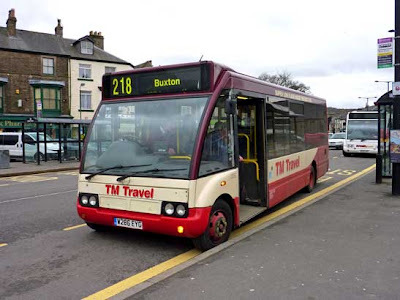 Had we stuck with the original plan, we'd've caught TM Travel's Service 215 from Grindleford Station to Bakewell and then Hulley's Service 170 to Chesterfield. As it was, we now were back in Buxton and boarded TM Travel's Service 66 to Chesterfield, which departed at 1630. Yet another Solo was provided - YN56 AHY - and the driver kindly allowed us to board a good 10 minutes before departure time, affording respite from the biting wind. 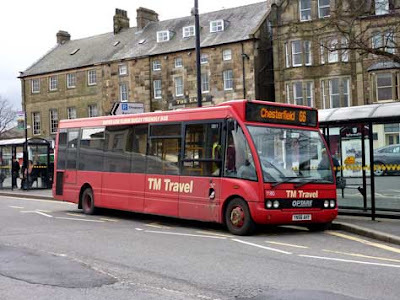 It was in an all-over red livery and during the week is used on services acquired with the business of Thompson Travel in 2005. Today, however, we were treated to the very scenic journey to Chesterfield via Millers Dale, Litton, Tideswell, Eyam, Calver Sough and Baslow. I can't help thinking that despite the capacity of some Solos rivalling that of a low-floor Dart, they're just not proper buses for riding these routes. Time was when these services were operated by Alexander PS-bodied B10Ms or ex-London Darts/Alexander Dash for Stagecoach - even TM Travel initially used DAF/Optare Sigmas and Hulleys operated Lynxes. Drivers cite the appaling steering lock and lack of front overhang as attributes that ironically make the Solo more difficult to drive than a full-size bus, but I'm not sure if I agree. 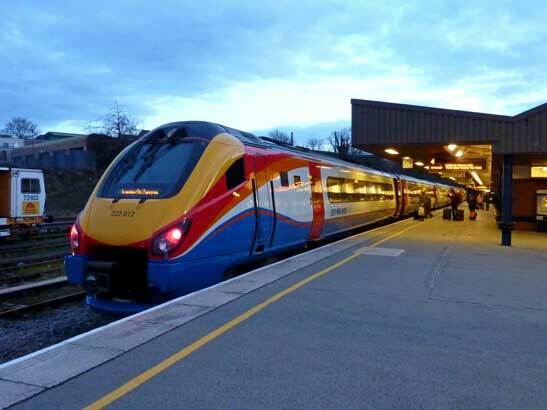 Back in Chesterfield, we made our second stroll to the train station and boarded a journey earlier than planned - a CrossCountry Class 220 'Voyager' - 220018 - at 1807, so that we could arrive in Derby with sufficient time to see the city's long-overdue bus station that opened a week ago. A separate blog entry will be made next week on this subject. 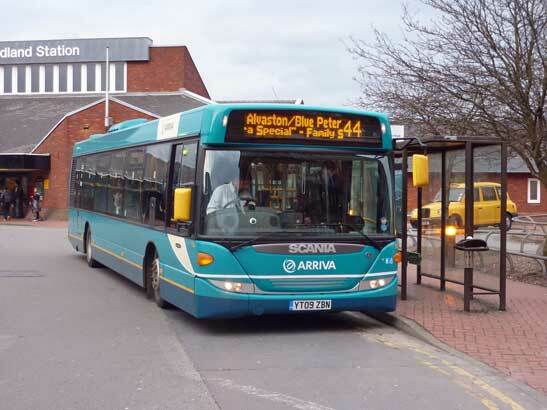 Our trip back to the station aboard one of Arriva Derby's nearly-new Scania Omnicities was interesting though. 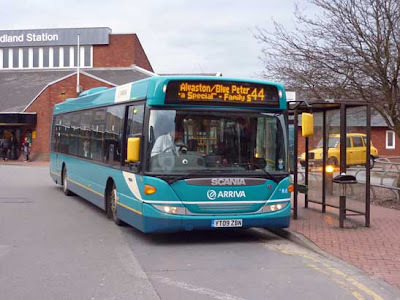 I've been on Nottingham's examples countless times, but Arriva Derby's have a different rear-end layout. They certainly look the business. We headed back to Leicester at 1918 aboard an EMT Meridan, 222012, bound for London St. Pancras and from there a CrossCountry Turbostar, 170397, to Stamford, arriving precisely at the booked 2100. I'm sure we've all had horror stories to tell, travelling by train over a Bank Holiday weekend, however, this jaunt saw the train services flying the flag, with EMT supplying additional resource and every single train journeys being accurate (rather than punctual, which can see trains arrive 8 minutes late and still be considered 'on time'). TM Travel let themselves down by not supplying a vehicle with adequate capacity for a journey from Sheffield into the Peak District (a decision clearly within their control) and their driver not loading up until 1 minute before departure time. Had we arrived Buxton 7 minutes earlier (1407), we'd have walked to the station for the 1430 train. The last photo of the day was of our EMT Meridian after dropping us at Leicester in order for us to catch our last train to Stamford. It was 8pm by now and we were very much enjoying the longer days! Despite this glitch, which prevented us a ride along the Hope Valley Line, the day went very well and was much improved from our last trip. We both heartily recommend the Derbyshire Wayfarer ticket for anyone visiting Derbyshire (not just the Dales and Peaks), which offers unsurpassed value for money. Well-written and informative. Many thanks. I would have been more annoyed that you seemed to be at having missed a trip along the Hope Valley Line. One of England's finest.